Crispy fried noodles is not only a key ingredient of the delicious American chopsuey recipe but can also be used as a irresistible topping for soup or Chinese sauce coated stir fried vegetables. This step by step photo recipe of crispy noodles also provides tips and serving ideas that will make cooking them at home a breeze. 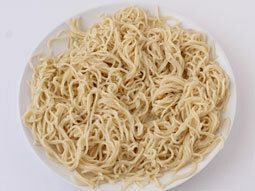 Prepare boiled noodles (boil them until they are almost cooked but not mushy, for around 3 minutes). Take them in a large bowl, sprinkle 2 tablespoons cornflour over it and toss gently. Spread them on a large plate and again sprinkle 1-tablespoon cornflour over it. Let them dry at room temperature for at least 30 minutes to remove excess moisture. Heat oil in a deep frying pan over medium flame. 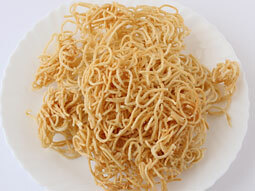 Deep fry boiled noodles in batches until light brown and crispy. Drain excess oil and transfer them on to oil absorbent paper spread on a plate. Crunchy noodles are ready. The noodles must be deep fried over medium flame/heat. If you deep fry them on very low flame then they will absorb more oil and if you deep fry them on high flame then they will turn brown immediately but will not turn crispy. 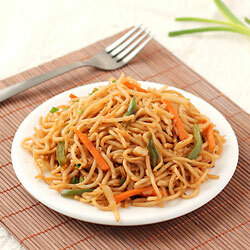 Do not boil noodles for more than 3 minutes or until mushy otherwise they may not turn crispy after deep-frying. You can prepare them in advance and store at room temperature for up to 15 days and use it whenever required. 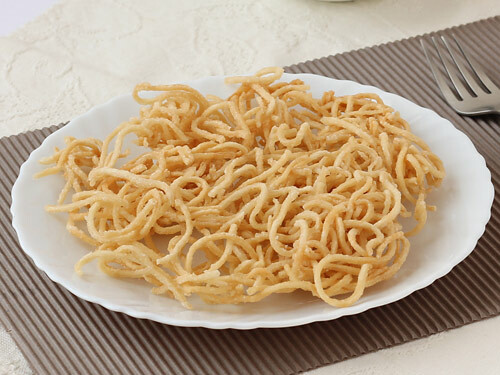 Serving Ideas: You can use fried crispy noodles in a variety of ways to make numerous indo-chinese dishes like American chopsuey, chinese stir fried vegetables, etc. It can also be used as taste and texture enhancer for Chinese soups or enjoyed as a standalone snack. Can we make it with vermicelli? Response: Hello Aadarsh, I have never tried it with vermicelli so I can't give you the answer on this. Nice recipes, it's very easy. Nice receipe. Very soon I am gonna try this. 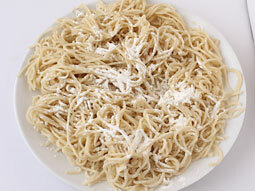 Nice receipe, can you share the brand name of noodles. Response: In this recipe, ching's hakka noodles are used but you can use any available brand's hakka noodles. Brilliant help easy to follow. Can you post chinese bhel recipe, please? And can you also post non veg recipes? Response: Hi, we will definitely try to upload the recipe of chinese bhel.